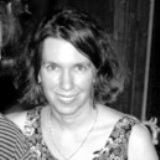 Deborah Finkelstein has an MFA in Creative Writing from Goddard College. Her poetry has been published in anthologies, literary magazines, and newspapers in Australia, Canada, Japan, India, New Zealand, Serbia, and the USA, as well as in online publications. Deborah teaches Creative Writing in Boston, Massachusetts; she has two dogs and enjoys hiking and seeing plays. Learn more about her at www.DeborahFinkelstein.com. love it, That's how to say a lot in a few words. Punching poem with a kind gesture morphed into female rivalry.. a delight! Love it! A quick and honest glimpse into human nature. Something else looks better on you. Ouch! Goodwill is such a thankless dinner guest.